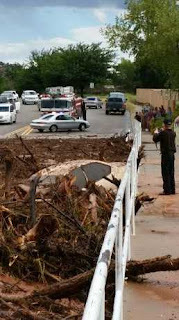 Flash floods in the western US state of Utah killed at least seven people Monday, state officials said. The disaster happened in the town of Hildale on the border with Arizona, the Utah Division of Emergency Management said on Twitter. A big wall of water hit people in their cars and washed them downstream, Hildale Fire Department Assistant Chief Kevin Barlow said, according to ABC News. The network said another six people were reported missing. Crews searched for missing people in the flood waters but scaled back the operation at nightfall because conditions were still dangerous. North Korea confirmed today that the nuclear reactor seen as the country's main source of weapons-grade plutonium had resumed normal operations. The air quality index in Singapore, where fears are mounting that the haze (Pictured, yesterday) could affect this weekend's Formula 1 Grand Prix, remained in the “unhealthy'' range today. Acrid smog caused by illegal fires set to clear vast tracts of land to make way for palm oil and pulp and paper plantations in Indonesia regularly sweep into Singapore and Malaysia. A street in Indonesia’s Pekanbaru in Riau province is nearly invisible today as a result of acrid smog caused by illegal fires set to clear vast tracts of land to make way for palm oil and pulp and paper plantations. Riau is the worst hit. Indonesia has failed to halt the practice despite years of pressure from its neighbors Malaysia and Singapore. 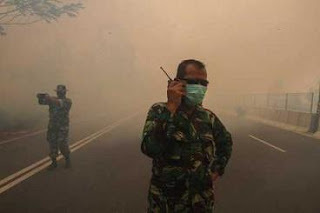 Indonesia deployed an extra 1,600 military personnel to fight forest and agricultural fires producing thick haze, as the smog closed schools in Malaysia and worsened air quality in Singapore. President Joko Widodo ordered the military ramp-up on Sumatra after authorities declared a state of emergency in the island's hard-hit Riau (Pictured) province yesterday. One thousand military personnel were sent to Riau while 600 were sent to South Sumatra, Indonesia's disaster agency said. They join over 1,000 soldiers sent to Sumatra last week. Smog-belching blazes, an annual problem in Southeast Asia, have intensified in Sumatra and the Indonesian part of Borneo island in the past two weeks, sending a cloud of acrid smog across the region. The illegal fires are set to clear vast tracts of land to make way for palm oil and pulp and paper plantations, and Indonesia has failed to halt the practice despite years of pressure from its neighbors. 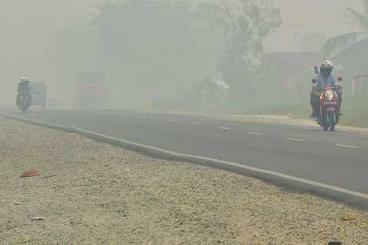 About 100 people and 15 companies are being investigated over the blazes, according to the disaster agency. Tens of thousands of people in smoke-choked regions of Sumatra and Borneo have fallen ill, while air travel there – as well as in parts of Malaysia – has been hit by sporadic flight delays or cancellations. 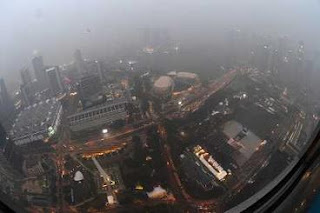 Malaysia's education ministry ordered schools closed in Kuala Lumpur, three adjacent states and the nearby administrative capital of Putrajaya, as the capital was enveloped in a smoky grey shroud. More than half of the country's 52 monitoring stations registered “unhealthy'' air today. The air quality index in Singapore, where fears are mounting that the haze could affect this weekend's Grand Prix, remained in the “unhealthy'' range today. Palestinians clashed with Israeli security forces at Jerusalem's flashpoint Al-Aqsa mosque compound for a third straight day today, an AFP correspondent reported. Young demonstrators gathered around the mosque threw stones at police who had entered the compound in large numbers and who responded with stun grenades. 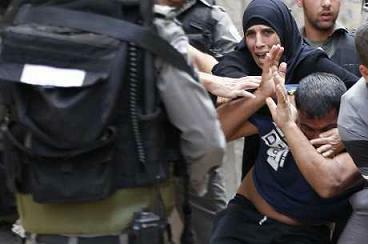 (Pictured, Palestinians confront Israeli riot police after security forces blocked a road leading to the Al-Aqsa mosque compound in Jerusalem's Old City yesterday). Mexico's foreign minister flew to Cairo late Monday to seek answers from Egyptian authorities over an air strike that mistakenly killed Mexican tourists. “We face a terrible loss of human lives and an unjustified attack that obligates us to make the protection of our citizens the priority,'' Foreign Minister Claudia Ruiz Massieu told reporters at Mexico City's international airport. Ruiz Massieu said she was traveling with seven relatives of some of the victims as well as Mexican doctors to care for the wounded. A foreign ministry official told AFP the plane took off at 11:46 pm local time. At least two Mexicans were confirmed dead, while another six were wounded. She said her government still could not confirm what happened to six other nationals. Egyptian authorities have said that a total of 12 people were killed and 10 wounded on Sunday when security forces fired on the group of tourists by mistake while hunting jihadists in the Western Desert. 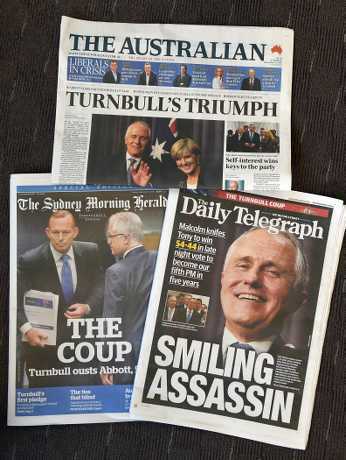 Some of the morning newspapers reflect perceptions in Australia following last night’s ouster of Tony Abbott from the prime minister’s job in a Liberal Party vote (54-44) and the entry of new Prime Minister Malcolm Turnbull. Turnbull became the 5th Prime Minister in five years. “He stole it by boasting of superior communication skills he does not have,’’ columnist Andrew Bolt added. “He will now campaign on successes by Abbott he could not have achieved himself. Leading daily, The Australian, noted that “Turnbull has not won the heart of the Liberal Party but he has commanded its self-interest. 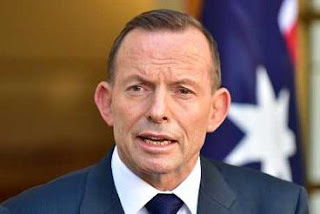 “The keys to this transformation are Tony Abbott’s multiple blunders, Turnbull’s astute management of his challenge and terror in the Liberal Party at the prospect of being a rejected one-term government. The paper said, “Turnbull’s arrival as prime minister offers a new hope and style for the Coalition government. It puts ALP leader Bill Shorten under serious pressure, yet it also poses fresh risks in terms of holding the conservative and liberal wings of the party together. Ousted Australian prime minister Tony Abbott made his final speech in office in Canberra today past noon, local time, before his successor Malcolm Turnbull was sworn in at the residence of the Governor General. "Quite a crowd here today, thank you for being here. “This is not an easy day for many people in this building. Leadership changes are never easy for this country. My pledge today is to make this change as easy as I can. There will be no wrecking, no undermining, and no sniping. “I’ve never leaked or backgrounded against anyone and I certainly won’t start now. Our country deserves better than that. “I want our government and our country to succeed, I always have and I always will. “I have consistently said in opposition and in government that being the prime minister is not an end in itself – it’s about the people you serve. “The great privilege that I have had, is to see the wonder of this country like few others, and I want to thank the Australian people for giving me the honour to serve. “Yes, this is a tough day but when you join the game, you accept the rules. “I’ve held true to what I believed and I’m proud of what we’ve achieved over the past two years. “It is humbling to lose, but that does not compare to the honour of being asked to lead. “300,000 more people are in jobs, Labor’s bad taxes are gone, we’ve signed free trade agreements with our largest trading partners, with Japan, with Korea and with China. “The biggest infrastructure program in our country’s history is underway. “A spotlight is being shone into the dark and corrupt corners of the union movement, and Labor’s party union business model. “We’ve responded to the threats of terror and we’ve deployed to the other side of the world, to bring our loved ones home. “The boats have stopped and with the boats stopped, we’ve been better able to display our compassion to refugees. “And despite hysterical and unprincipled opposition, we’ve made $50 billion of repairs to the budget. “Of course there’s much that I had still wanted to do – constitutional recognition of Indigenous people; getting the kids to school, the adults to work, and communities safe. “I was the first prime minister to spend a week a year in remote, Indigenous Australia, and I hope I’m not the last. “Then there’s the challenge of ice, and domestic violence – yet to be addressed. “Australia has a role to play in the struggles of the wider world, the cauldron of the Middle East, and security in the South China Sea and elsewhere. “I fear that none of this will be helped if the leadership instability that’s plagued other countries continues to taint us. “But yes I am proud of what the Abbott government has achieved. We stayed focused, despite the white-anting. “Of course the government wasn’t perfect - we have been a government of men and women, not a government of gods walking upon the earth – few of us, after all, entirely measure up to expectations. 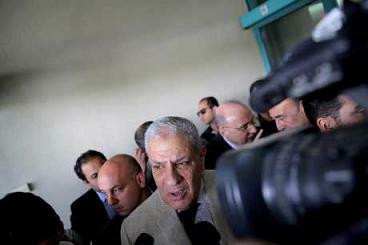 “The nature of politics has changed in the past decade. “We have more polls, and more commentary than ever before, mostly sour, bitter character assassination. “Poll-driven panic has produced a revolving door prime ministership, which can’t be good for our country, and a febrile media culture has developed that rewards treachery. “And if there’s one piece of advice I can give to the media, it’s this – refuse to print self-serving claims, that the person making them won’t put his or her name to. Refuse to connive or dishonour, by acting as the assassin’s knife. “There are many to thank for the privilege of being prime minister. First and foremost, I thank my family, for allowing me to be the absentee spouse and parent that politics entails. “I thank Margie, for her grace and dignity throughout my public life. I thank my party for the privilege of leading it, I thank the armed forces who are serving our country and defending our values, even as we speak. “I thank my staff who have been absolutely unceasing in their devotion to our party and our country, especially my chief of staff (Peta Credlin) who has been unfairly maligned, by people who should have known better. “Finally, I thank my country, for the privilege of service. It is humbling to lose, but that does not compare to the honour of being asked to lead. “In my maiden speech here in this parliament, I quoted from the first Christian service, ever preached here in Australia.